The Last Dinosaur draws a big crowd, I guess?? I don’t exactly know what happened here. What was it about The Last Dinosaur (1977) that compelled a fully packed Kaijucast HQ tonight? 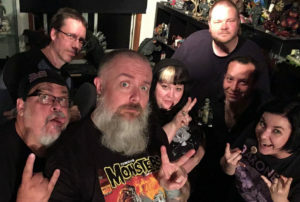 Maybe my co-hosts are drawn to the smell of cheese… Anyway, I was joined by Adam, Jeff, Clancy, Sean, Gretchen AND Rachel for this discussion — and it was a doozy! Perhaps your mileage may vary, but we made sure to enjoy ourselves during this one. The Last Dinosaur is such a bizarre entry in the genre and even after saying that, I don’t actually think I’d really classify this as a kaiju film – kind of in the same way I wouldn’t normally consider the American made King Kong movies to be kaiju fare. In addition to the news, there were a lot of catastrophic events to talk about, so check out all of these tasty show notes below! Summit Kaiju’s social network launches! 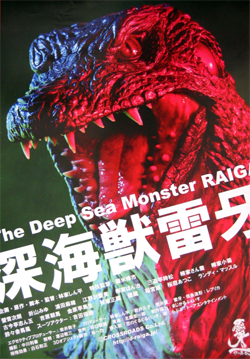 Our next movie will be Shinpei Hayashiya’s kaiju comedy The Deep-Sea Monster Raiga (2009) — his follow up to his 2005 indie film Deep Sea Monster Reigo! Now this is one of the few movies that I put on this list that is not available commercially in the USA, but it was released in Japan. If you have the film and would like to send in your thoughts, questions and reviews for the discussion, please submit your homework before October 21st!